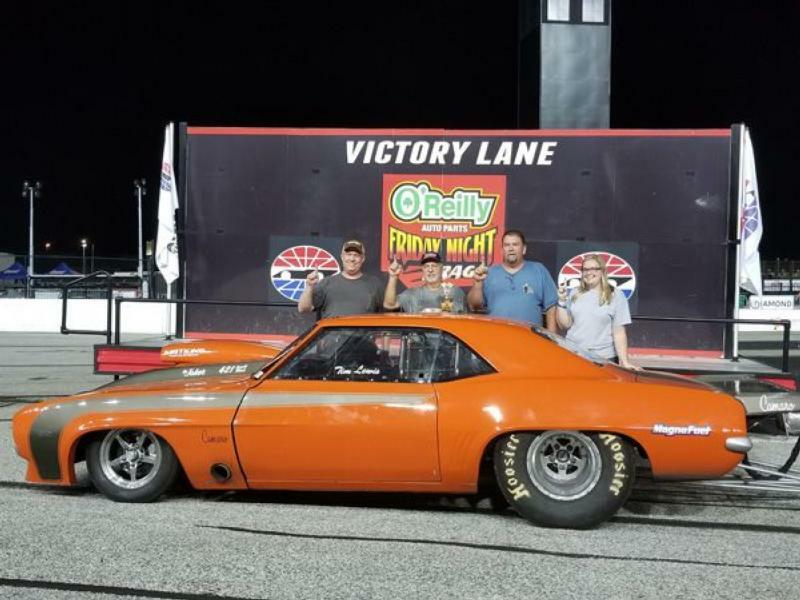 On a night full of perfect drag racing weather, the masses gathered at Atlanta Motor Speedway for July 20 O'Reilly Auto Parts Friday Night Drags action. The infield was packed as kids opened up the night with the return of Kids Power Wheels Races. After the kids showed the adults how it was done, the series regulars took to the strip to improve upon their championship standings. Thrilling drag racing action filled the evening as each division completed runs, trickling down to the best competitors of the night. As the event drew to a close, the final races held everyone's attention. In the QuikTrip Pro Division, an extremely tight battle down the strip ensued between Milner's David Clevenger in and McDonough's Kevin Mayo. Ultimately, Mayo came out on top. Likewise, in the Super Pro divsion, Stockbridge's Alan Kidd battled Locust Grove's Arnie Cobb. The two were neck and neck down the entire strip. As the finish line light glowed, Kidd was declared the winner. "I had to have good reaction time off the light", explained Kidd. He [Cobb] came sprawling of the other end, he probably wasn't even a bumper or a fender away from me it was that close." Meanwhile in the New Edge Division, a close race brewed between Newnan's Steve Shaffer in his 2018 Chevrolet Corvette, and Fayetteville's James Walker in his 2016 Dodge Challenger Hellcat. Walker had already won the Peach Pass Burnout Zone Competition and was ready to take home his division. In the final round, Shaffer and Walker raced down the AMS drag strip in a battle of sports car horsepower. As all bets were on the Corvette, Walker turned the tables and drove his Hellcat to victory. "Basically tonight I needed to hook up", said Walker. "The whole idea for me is to get the power to the ground. I've been working on that for a while and it finally came together tonight. I know the car has a lot of horsepower so my focus is to really keep that power to the ground and make those runs as strong as I can." Atlanta Motor Speedway's O'Reilly Auto Parts Friday Night Drags & Show-N-Shine returns to the pit lane drag strip next Friday, July 27th. This night will also feature special races for the powerful and thrilling jet dragsters. Grandstand gates open at 6:30 p.m., and nightly drag race eliminations start just after 9:00 p.m. Entry to drag race or for the Show-N-Shine is just $20 or competitors can purchase a combo ticket for $30. Spectator tickets are just $10, and children 5 and under are free. More information can be found at www.atlantamotorspeedway.com/drags or by calling the Atlanta Motor Speedway Ticket Office at (770) 946-4211.